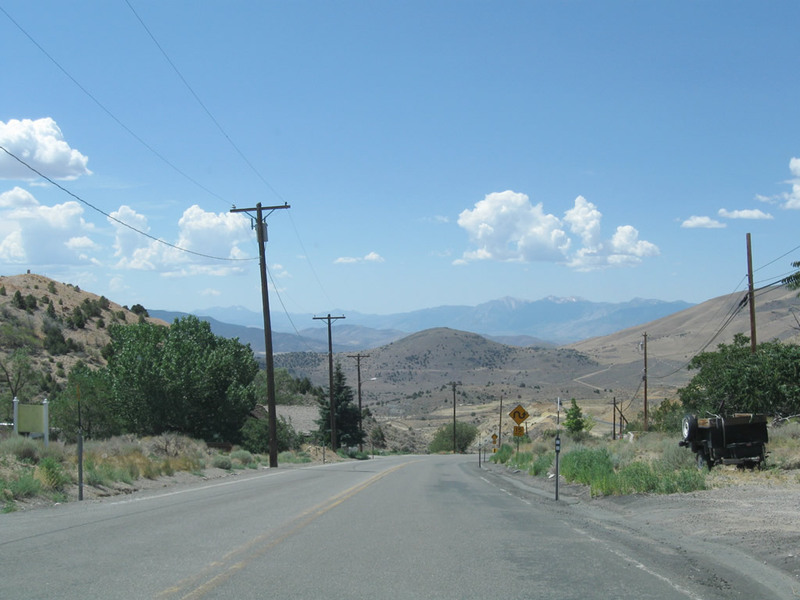 Looking down from the Virginia & Truckee Railroad is this view of Gold Hill and Nevada 342 as the Comstock Highway winds its way through town. Photo taken 07/23/09. 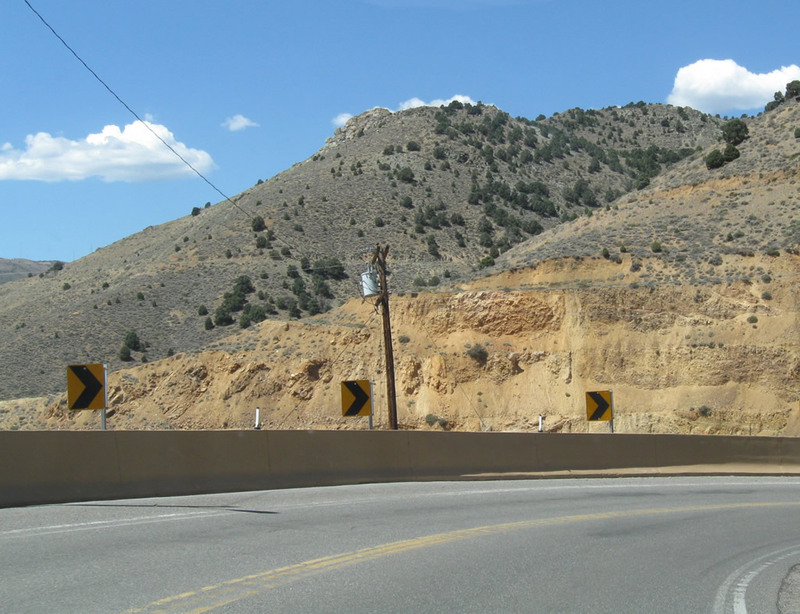 Nevada 342 is the old route of Nevada 341 near Virginia City via Silver City, Gold Canyon, and Gold Hill. 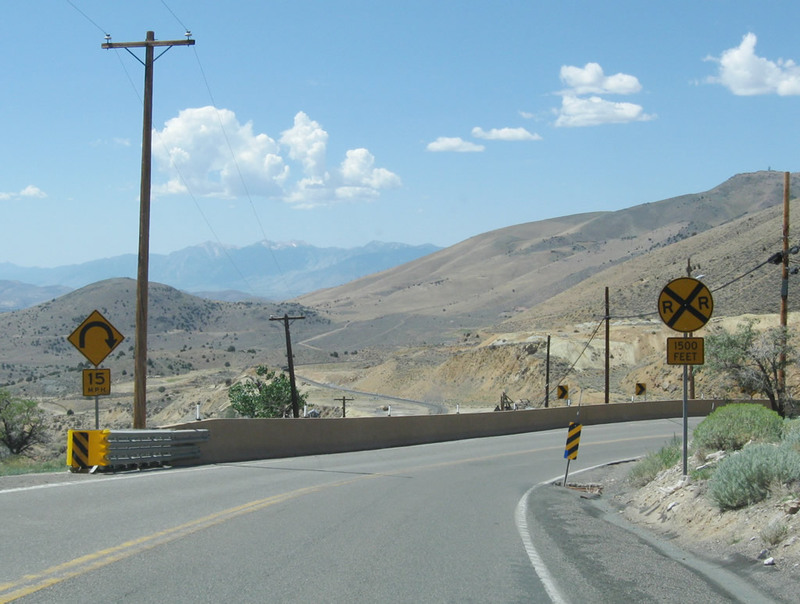 Prior the 1976 renumbering, Nevada 342 was designated as Nevada 80. 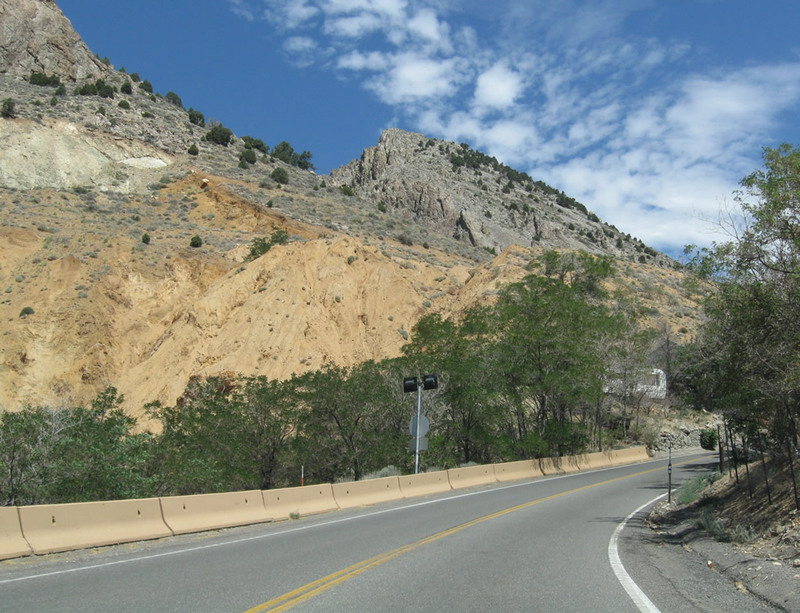 This is the older and shorter route between Silver City and Gold Hill, but due to steep grades (especially at the north end), through traffic is advised to use Nevada 341 (former Nevada 17) over Occidental Grade. 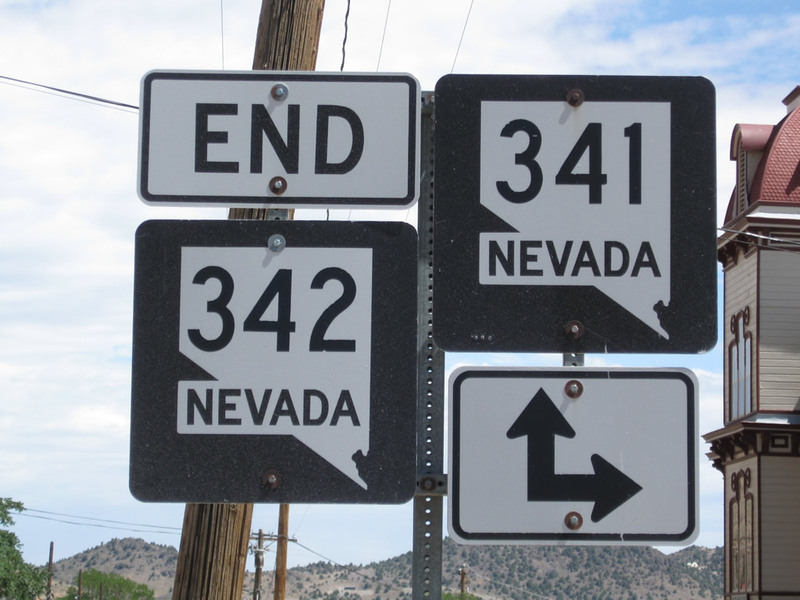 Along with Nevada 341, Nevada 342 is part of the Comstock Highway. 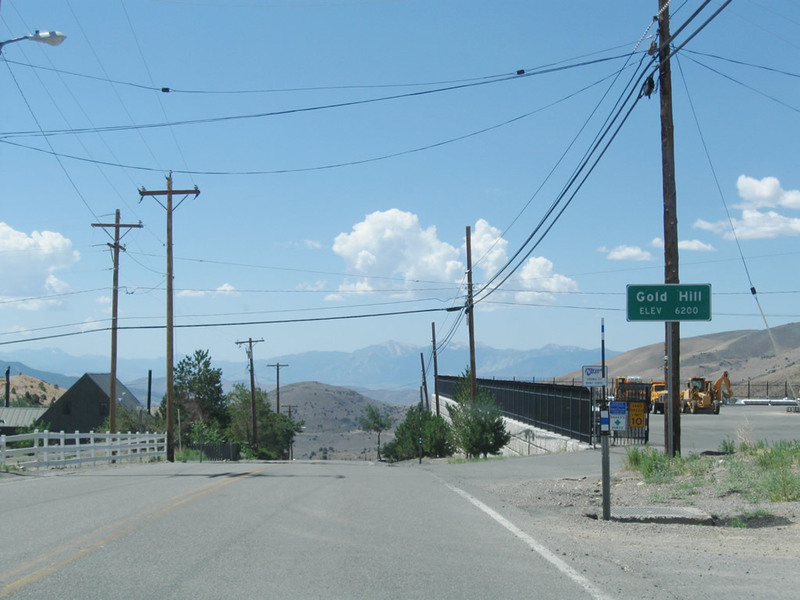 Leaving downtown Gold Hill, northbound Nevada 342 crosses the Virginia & Truckee Railroad ahead of a 15% grade. Photo taken 07/23/09. 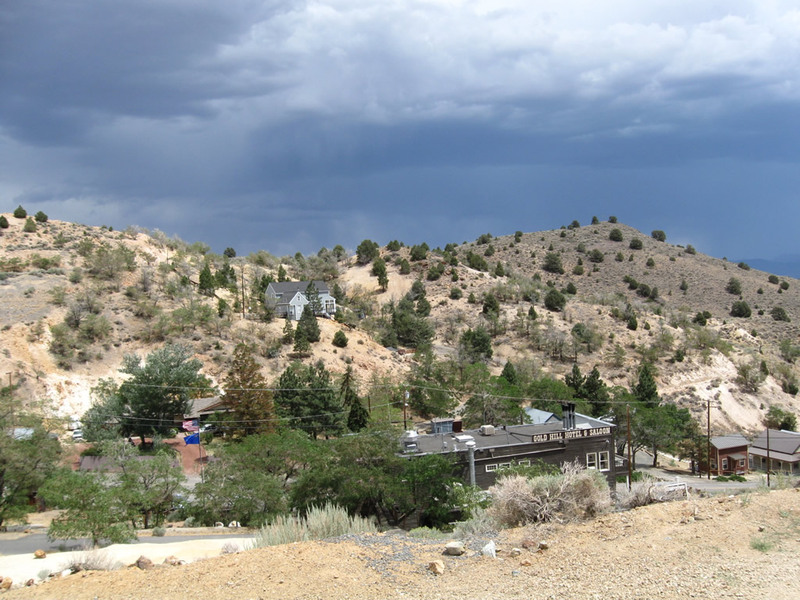 The Virginia & Truckee Railroad is a popular visitor activity in Gold Hill and Virginia City. 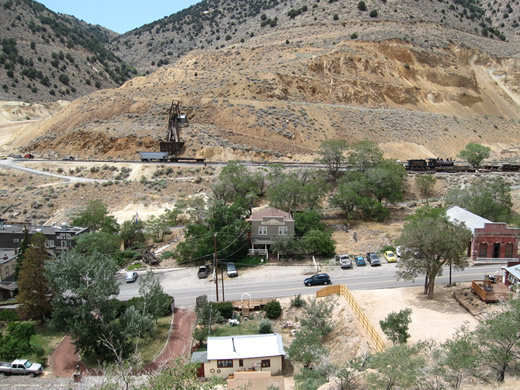 Daily trips take tourists from Virginia City downhill on a steam locomotive-driven train to Gold Hill through Tunnel #4. 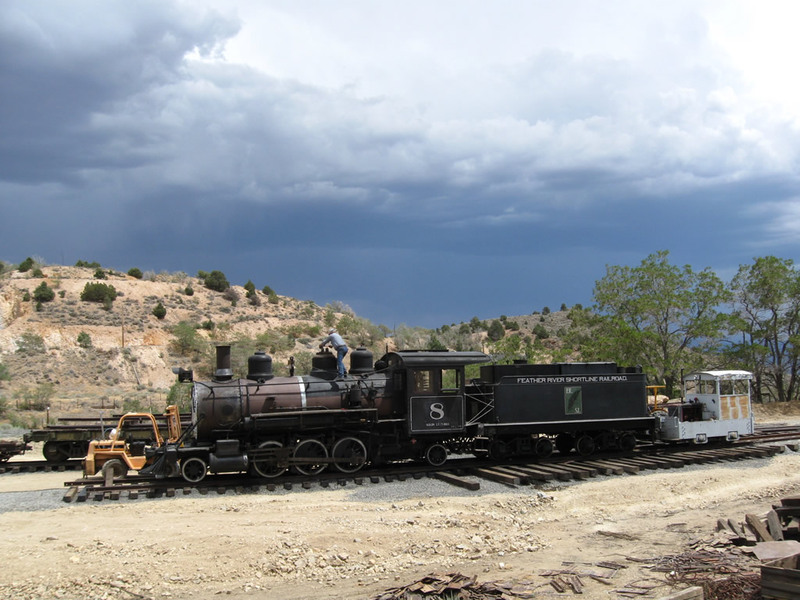 The railroad was first built in 1869 to move mining material from Virginia City and Gold Hill south to Carson City. 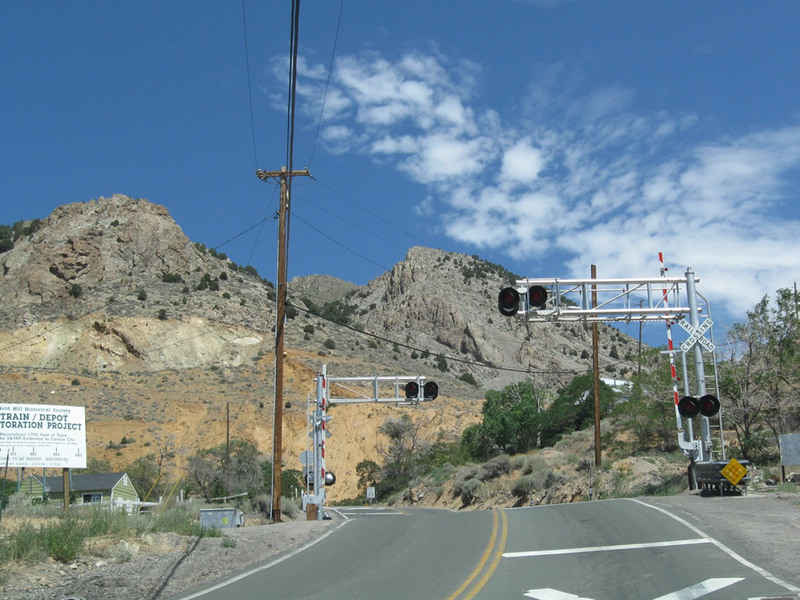 Plans call for the tourist train to extend all the way to Carson City. Photo taken 07/23/09. 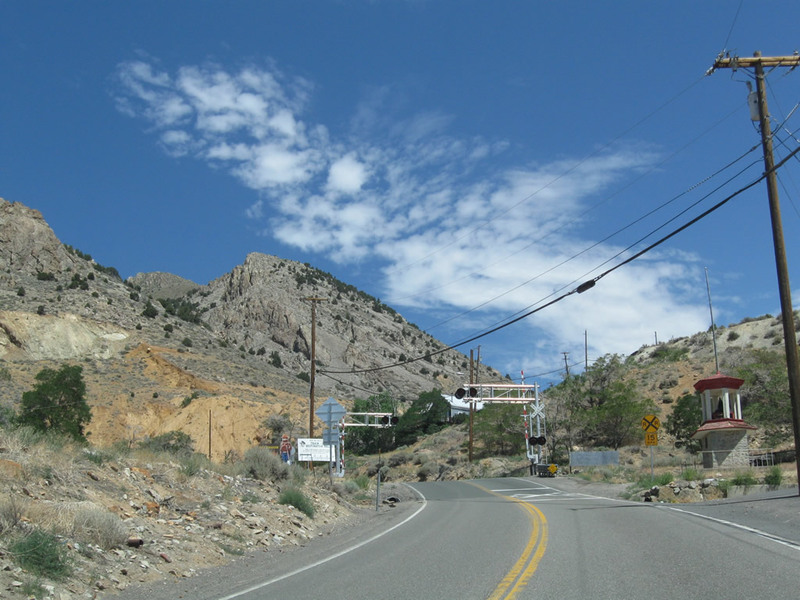 Leaving Gold Canyon, northbound Nevada 342 begins its final ascent to Virginia City. 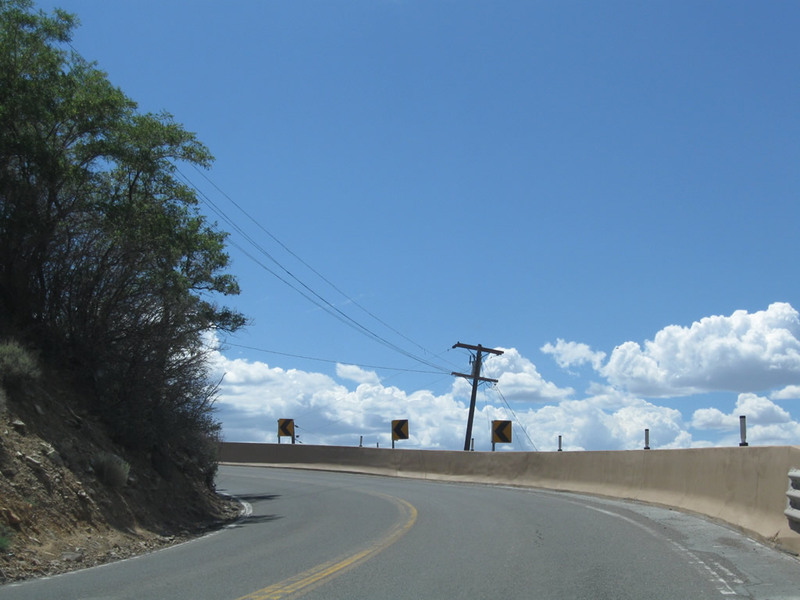 The two-lane highway will see several curves as it travels uphill. 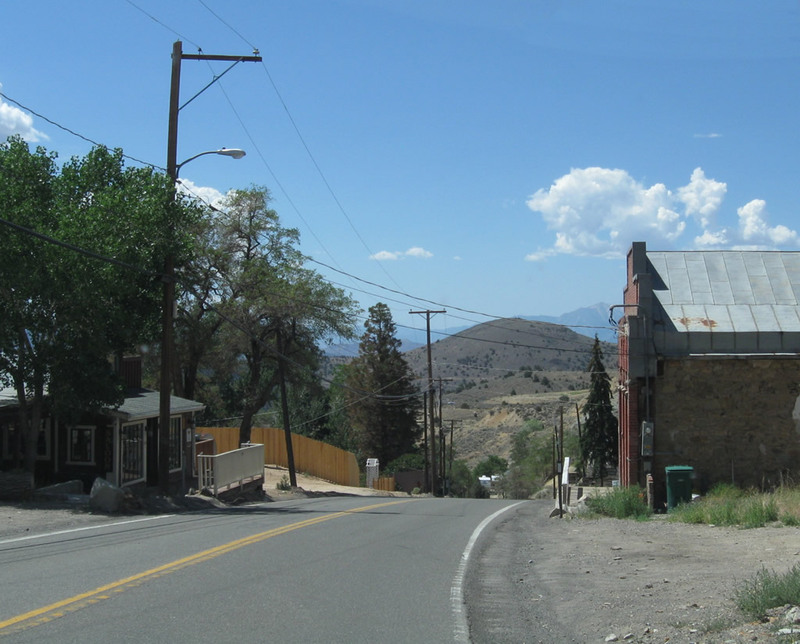 At the top of the hill, Nevada 342 leaves Gold Hill and enters Virginia City in the heart of Storey County. Photos taken 07/23/09. 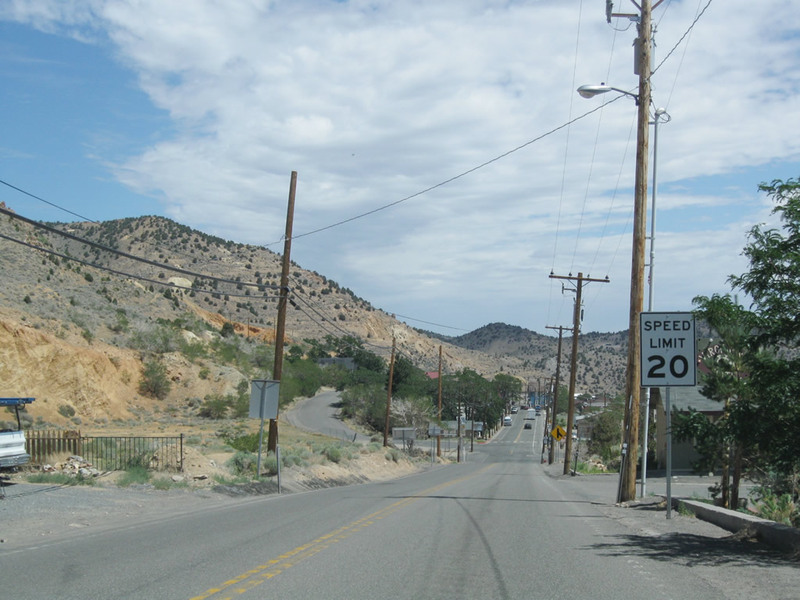 The speed limit drops from 25 miles per hour to 20 miles per hour as Virginia City comes into view ahead. Watch for cross traffic ahead. Photo taken 07/23/09. The next intersection along Nevada 342 north is with Nevada 341 south (next right). 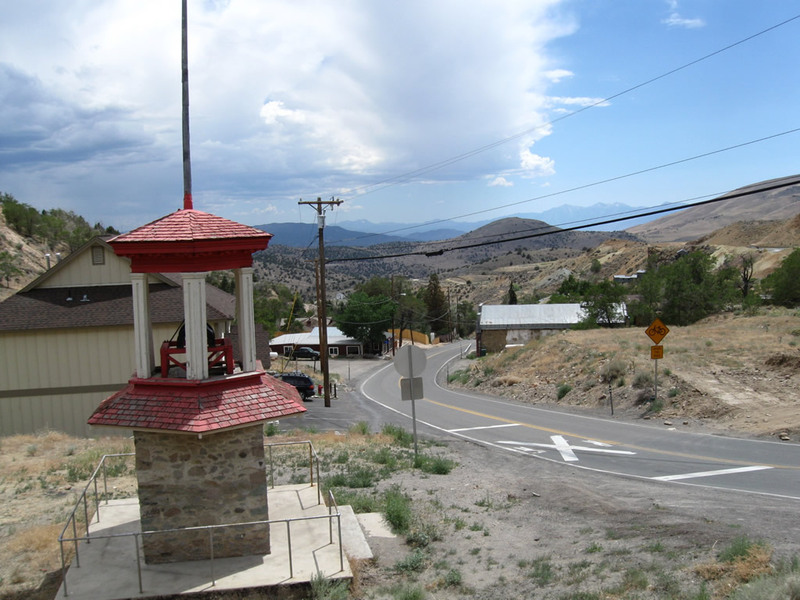 Through traffic from Nevada 342 south to Nevada 341 south into Virginia City does not need to stop at this intersection. Photo taken 07/23/09. 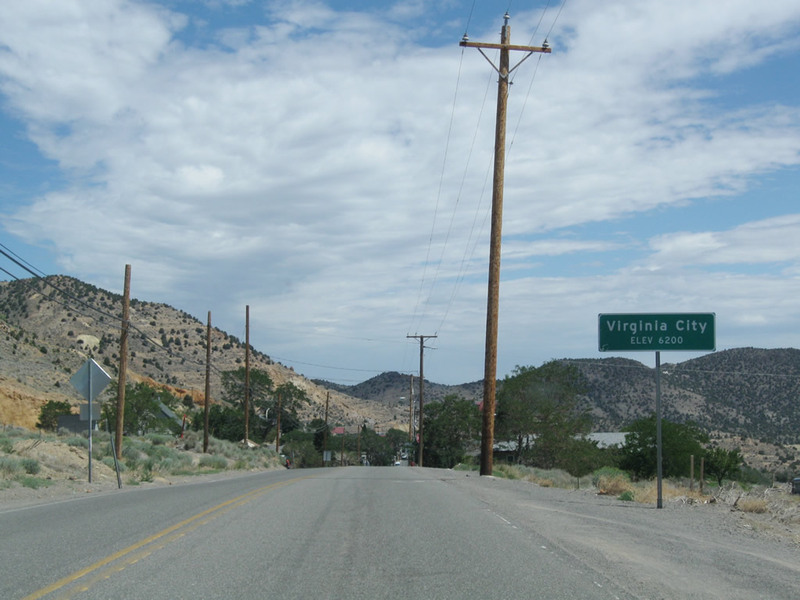 Nevada 342 approaches its junction with Nevada 341 as we enter Virginia City, the seat of Storey County (elevation of 6,200 feet above sea level). 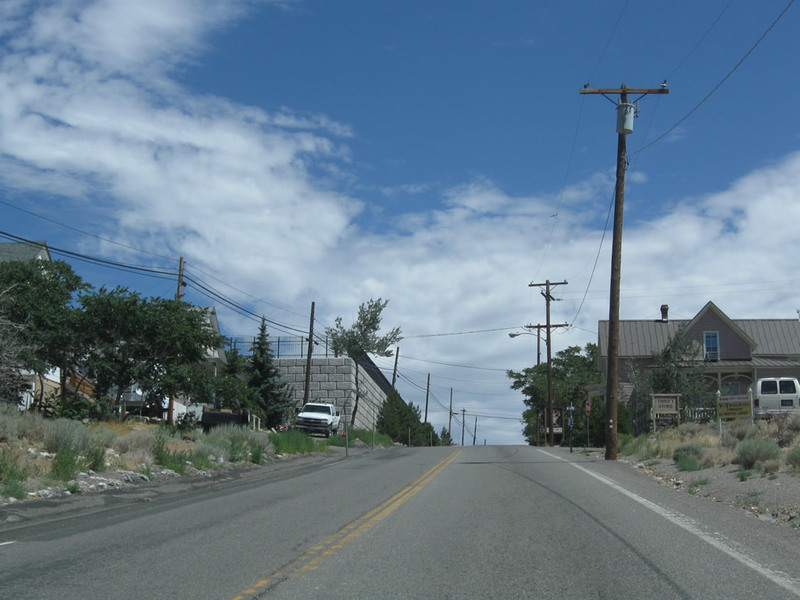 Continue straight for Nevada 341/C Street north into downtown Virginia City or turn right for Nevada 341 south along the Occidental Grade back to Silver City and U.S. 50 in Lyon County. Photo taken 07/23/09. 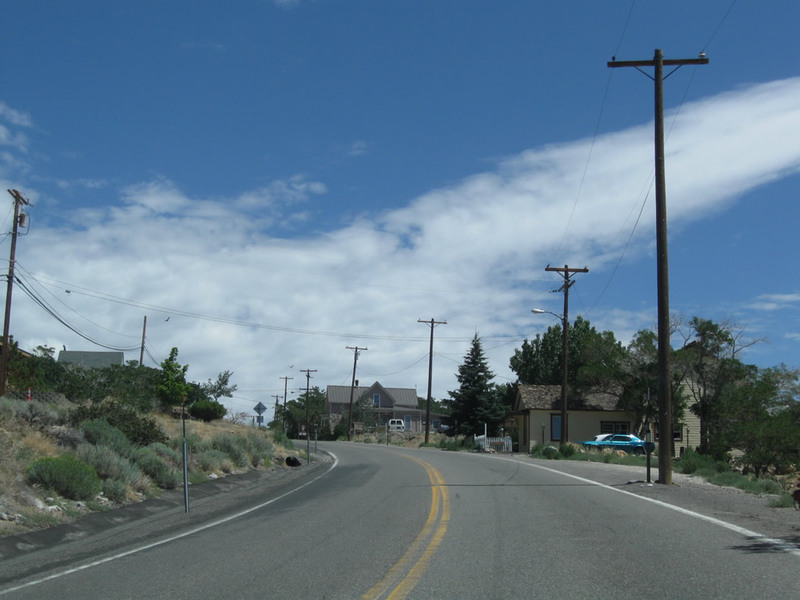 Northbound Nevada 342 ends at its junction with Nevada 341 near the Fourth Ward School at the intersection of Nevada 341 and C Street. 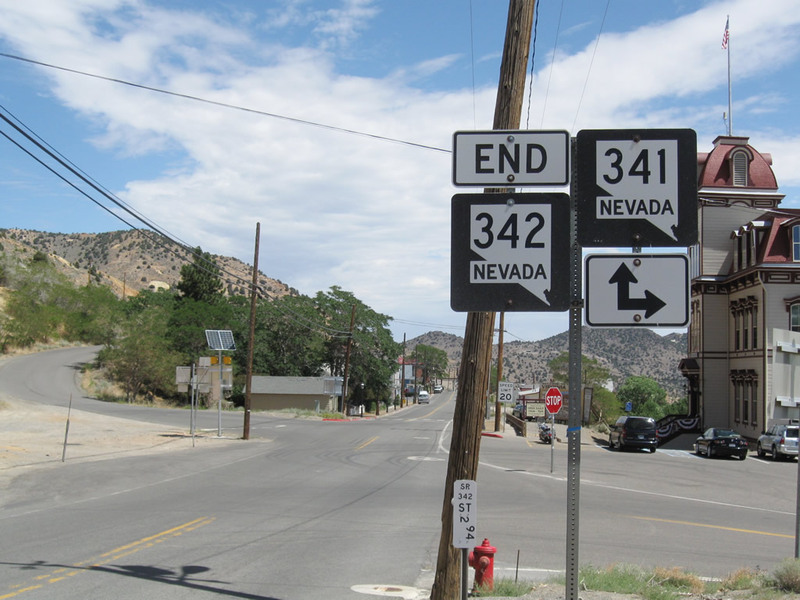 An end shield is posted for Nevada 342. Photo taken 07/23/09. 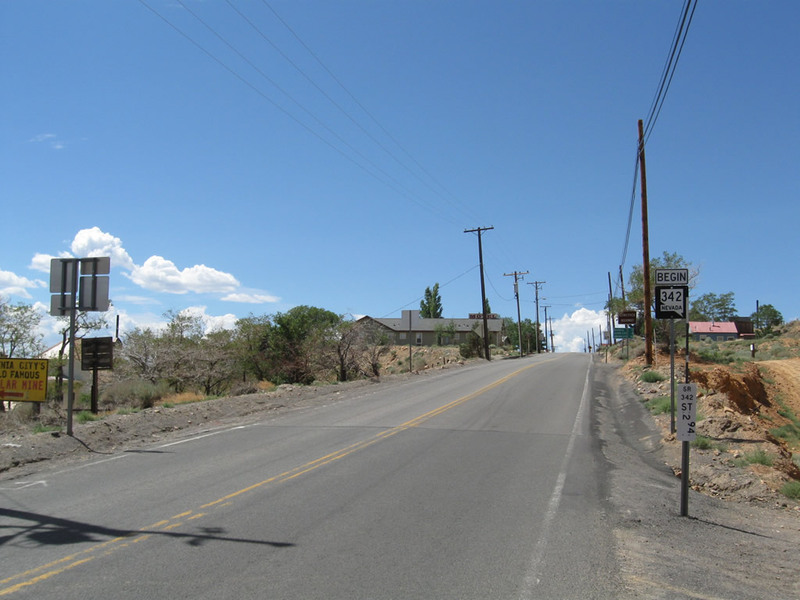 A final milepost reference marker for Nevada 342 north is posted at the intersection with Nevada 341. Photo taken 07/23/09. 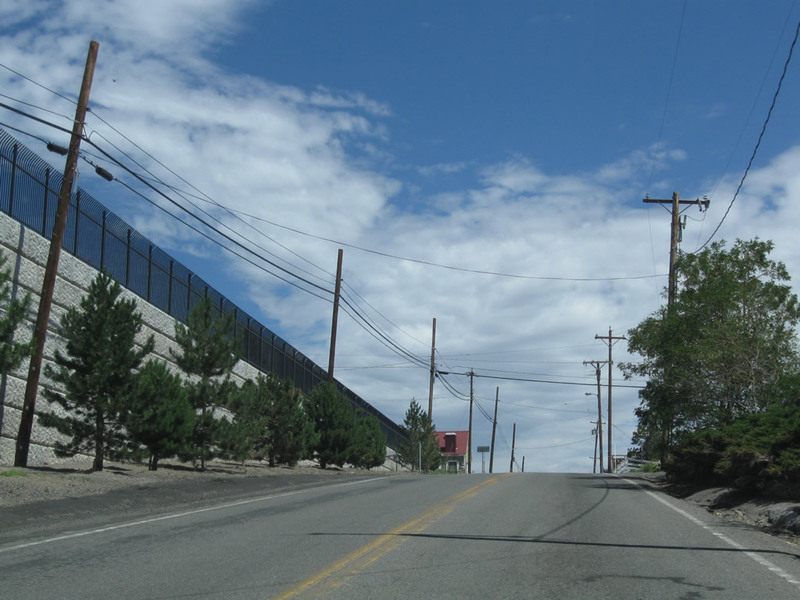 The Fourth Ward School dominates the view for inbound traffic on Nevada 342. 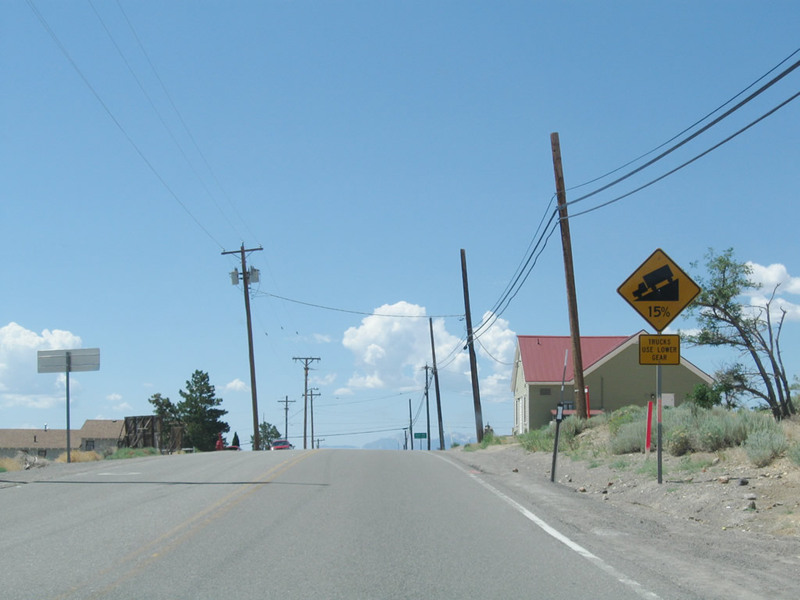 This view looks north from the intersection with Nevada 341. Photo taken 07/23/09. 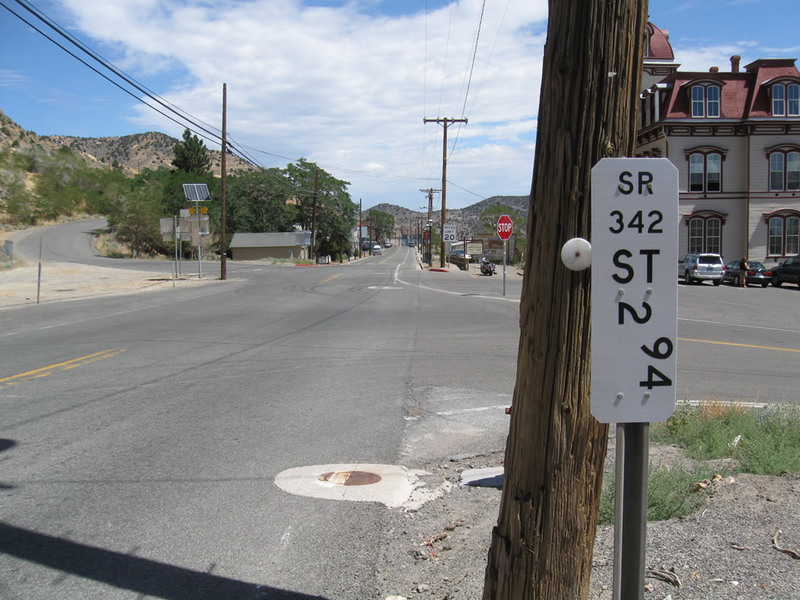 Leaving Nevada 341 in southern Virginia City, a reference marker indicates the mileage on Nevada 342 south from the Nevada 341 split to the Storey-Lyon County Line. 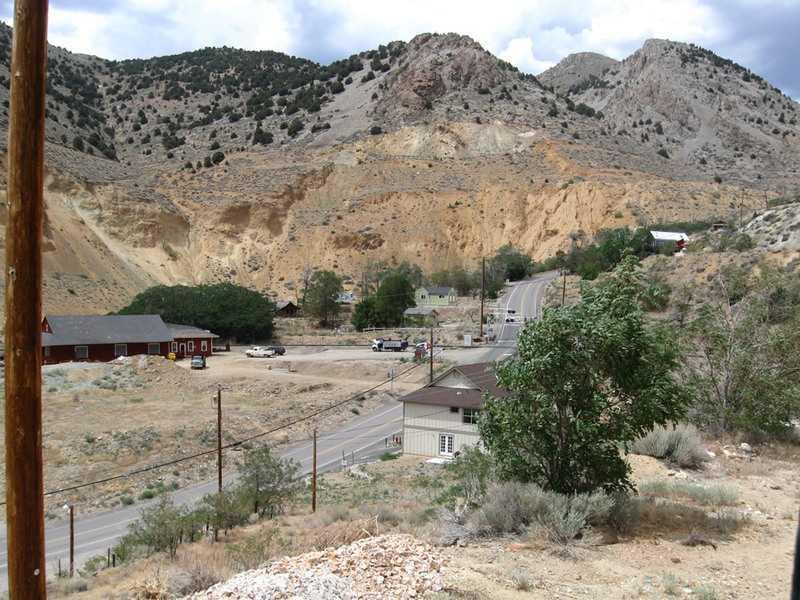 Nevada 342 will travel down a steep grade into Gold Hill, then proceed south through Gold Canyon to meet Nevada 341 again just south of Silver City in Lyon County. Photo taken 07/23/09. 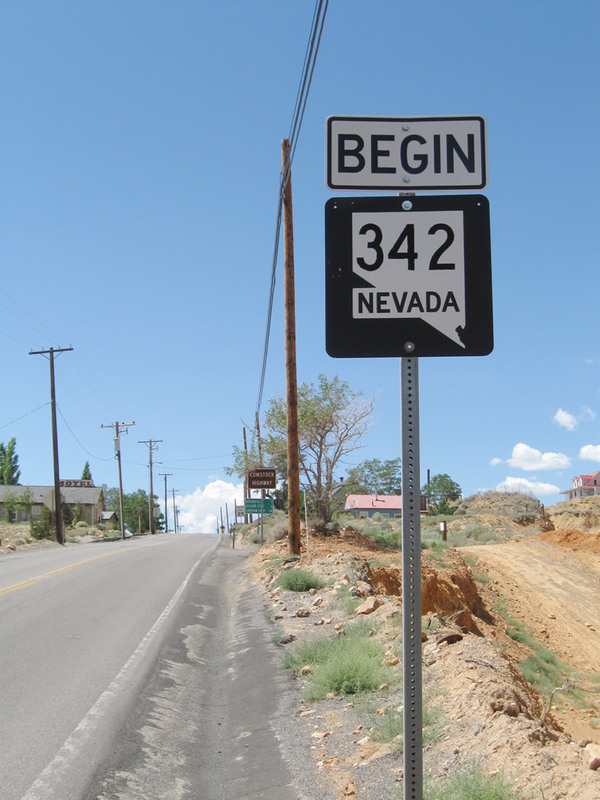 A begin Nevada 342 route marker. 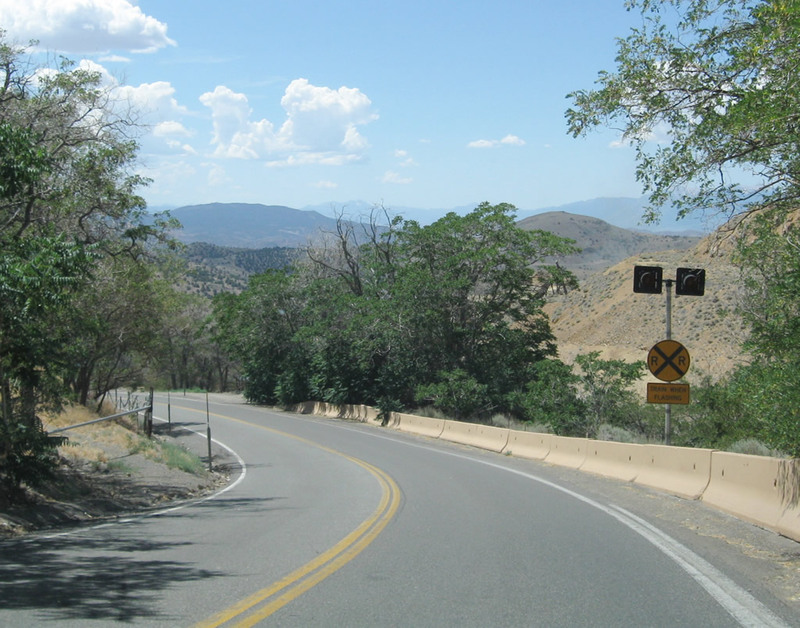 Nevada 342 is a loop route that avoids Occidental Grade by staying in Gold Canyon between Gold Hill and Silver City. Photo taken 07/23/09. 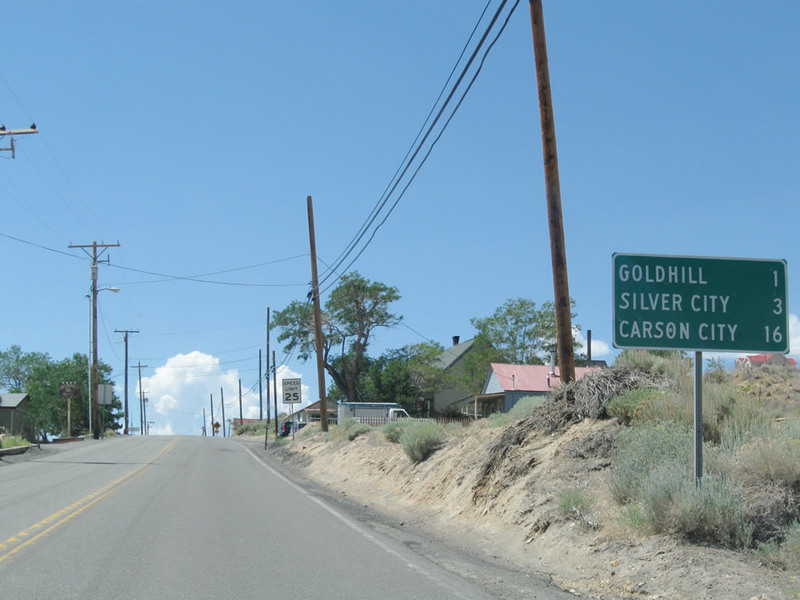 This mileage sign along Nevada 342/Comstock Highway south provides the distance to Gold Hill (one mile), Silver City (three miles), and Carson City (16 miles via U.S. 50 west). Photo taken 07/23/09. 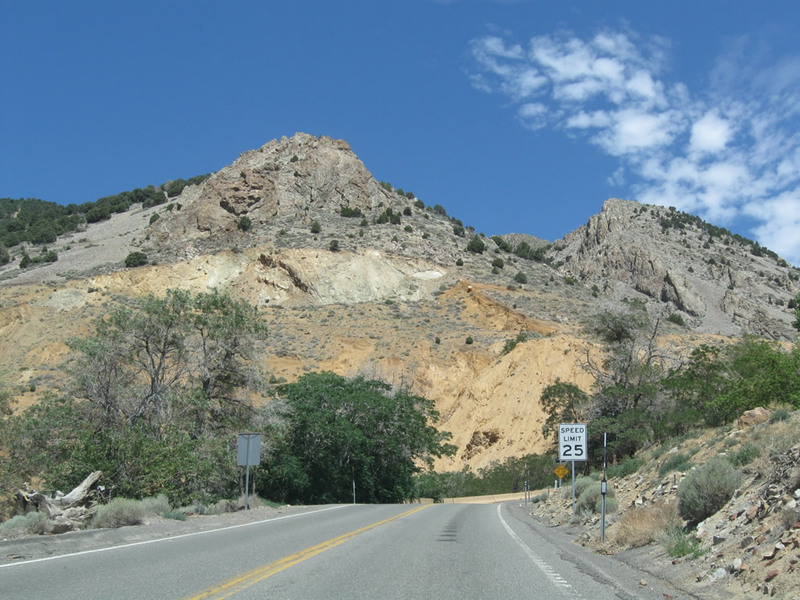 The approaching 15% downgrade from Virginia City to Gold Hill is a primary reason why trucks are routed onto Nevada 341 rather than Nevada 342 for through traffic. Photo taken 07/23/09. 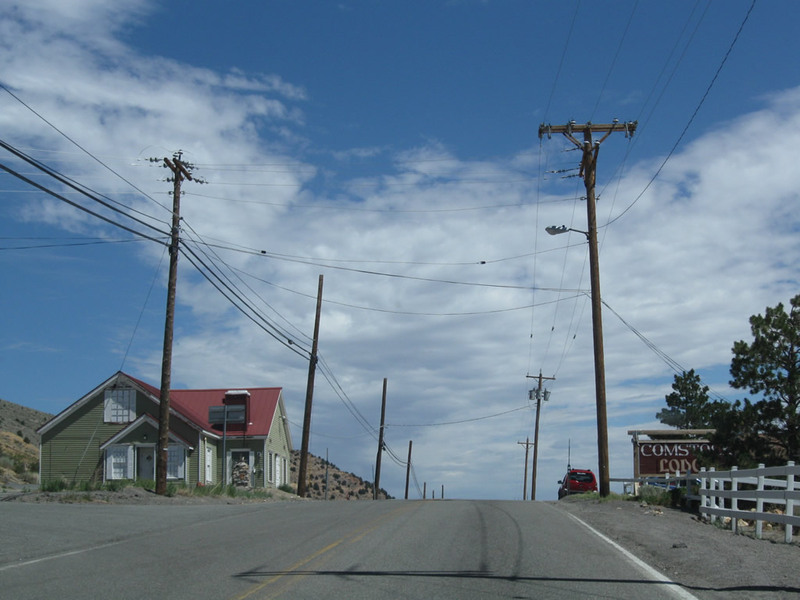 At the top of the grade, southbound Nevada 342 enters the community of Gold Hill, another historic mining community with a heritage closely linked to Virginia City and the Comstock Lode. 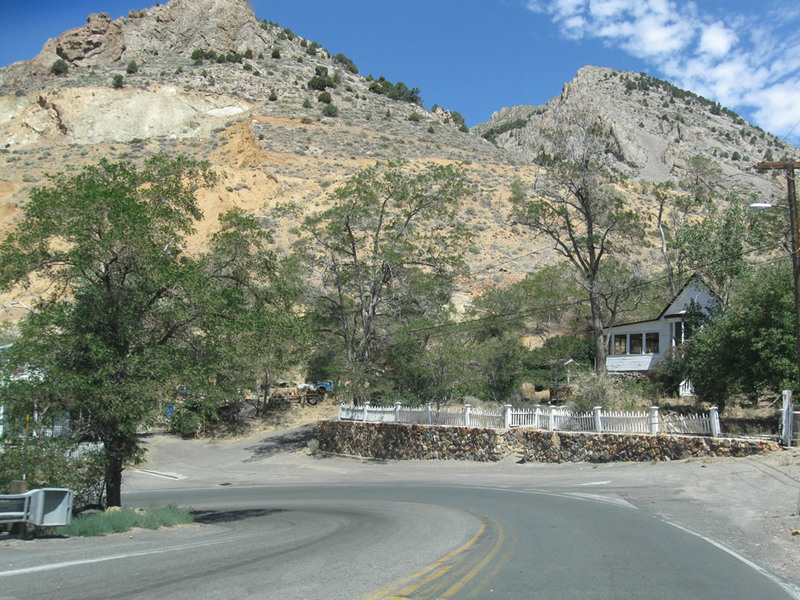 Gold Hill is home to the Gold Hill Hotel, Nevada's oldest hotel. 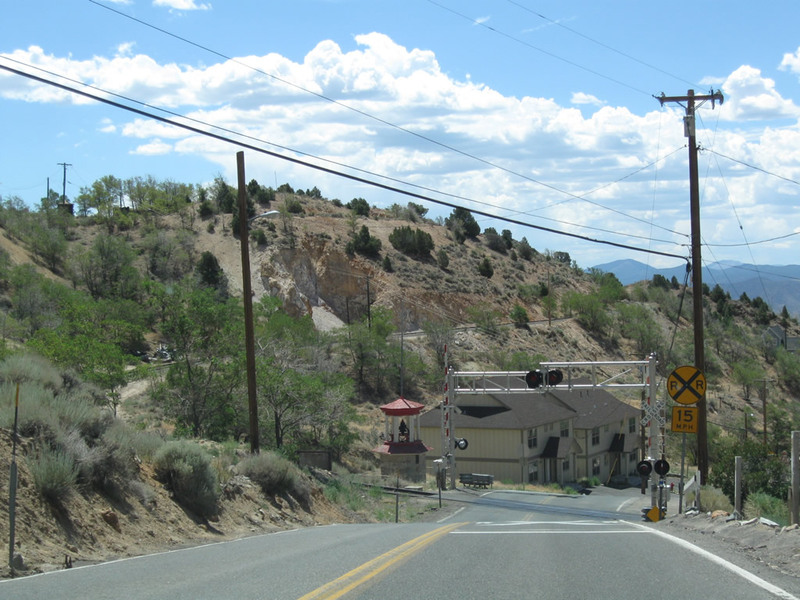 Currently, the Virginia & Truckee Railroad (a tourist attraction) takes visitors between Virginia City and Gold Hill; the tourist train will soon extend to Carson City. Photo taken 07/23/09. 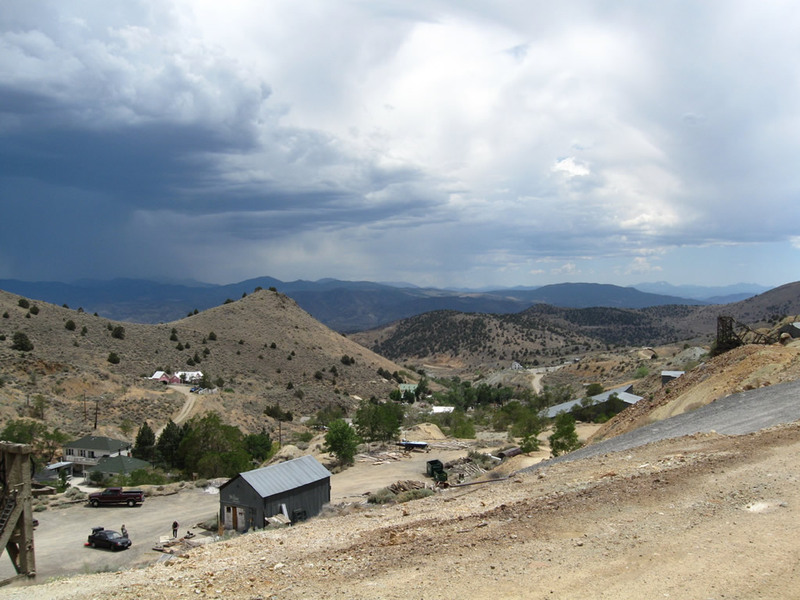 It is a steep downhill grade from Virginia City to Gold Hill. Watch your speed descending this very steep hill. 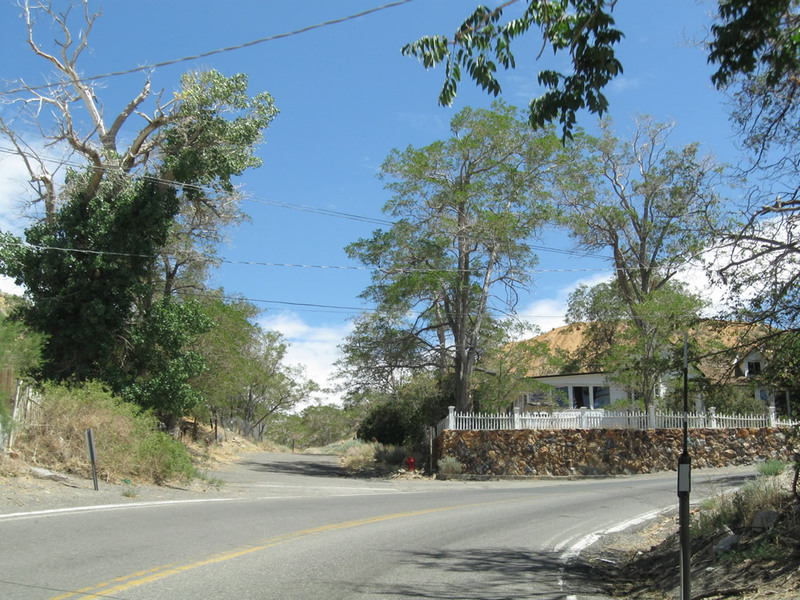 The remnants of once-bustling downtown Gold Hill are at the bottom of the hill, before the state route enters Gold Canyon. Photos taken 07/23/09. 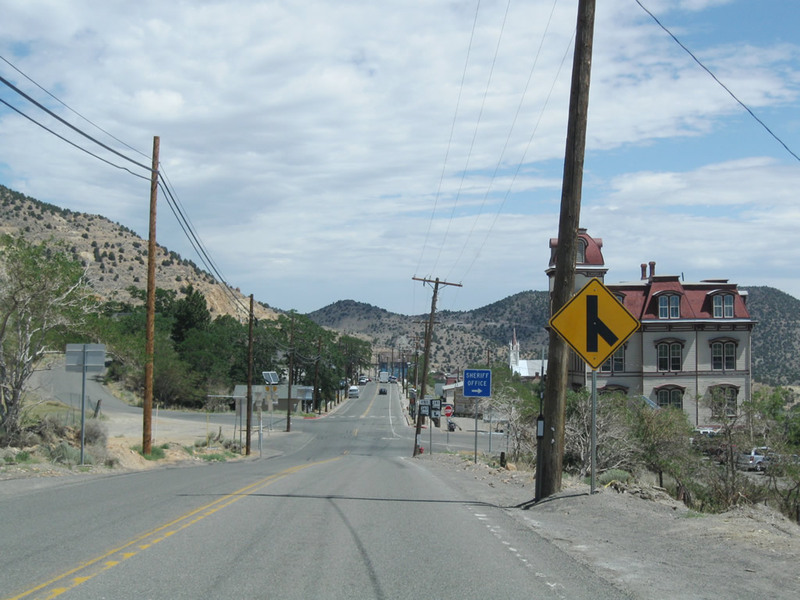 Southbound Nevada 342 enters downtown Gold Hill. 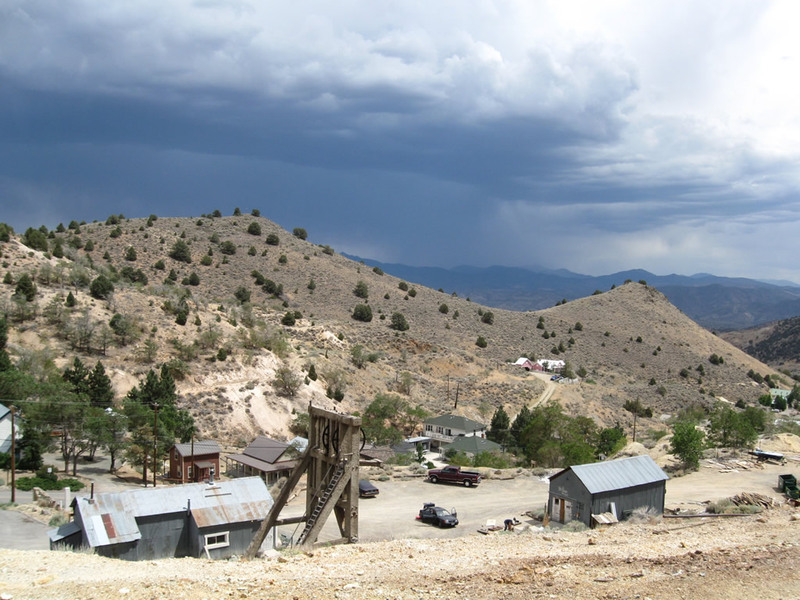 Like neighboring Virginia City, Gold Hill saw its heyday during the mining era of the 1860s and 1870s; over 8,000 people once called this town home, although less than 200 live there as of 2000. 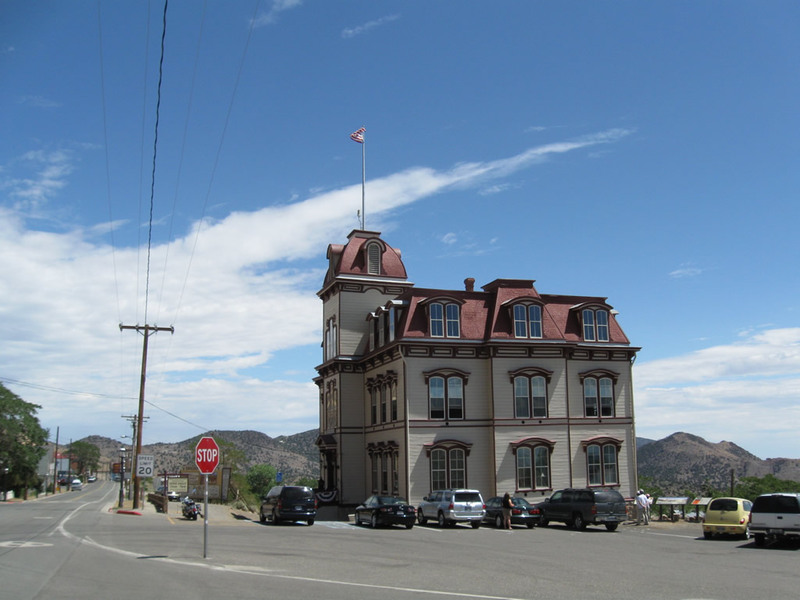 The Gold Hill Hotel still entices travelers to visit for the night in this historic community. Photo taken 07/23/09. 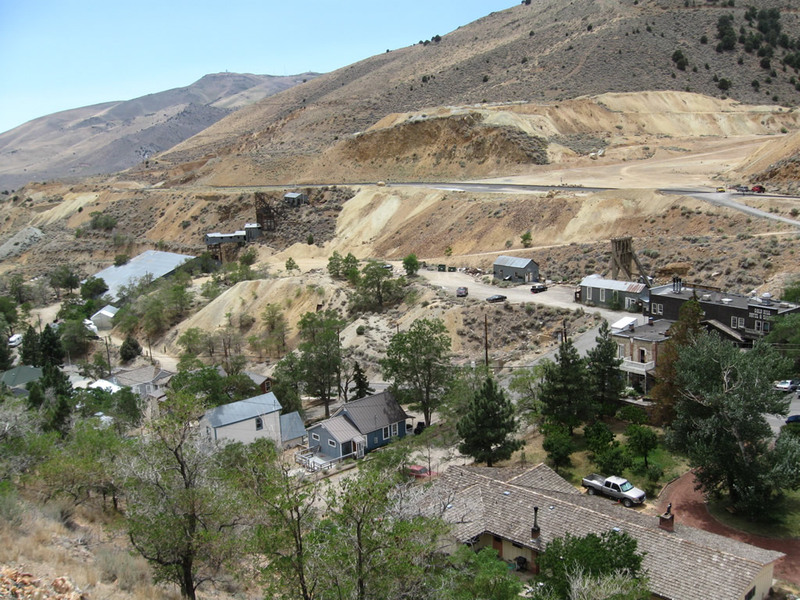 This series of photos shows Gold Hill and Nevada 342 as seen from the Virginia & Truckee Railroad tour, which connects Virginia City and Gold Hill each day. 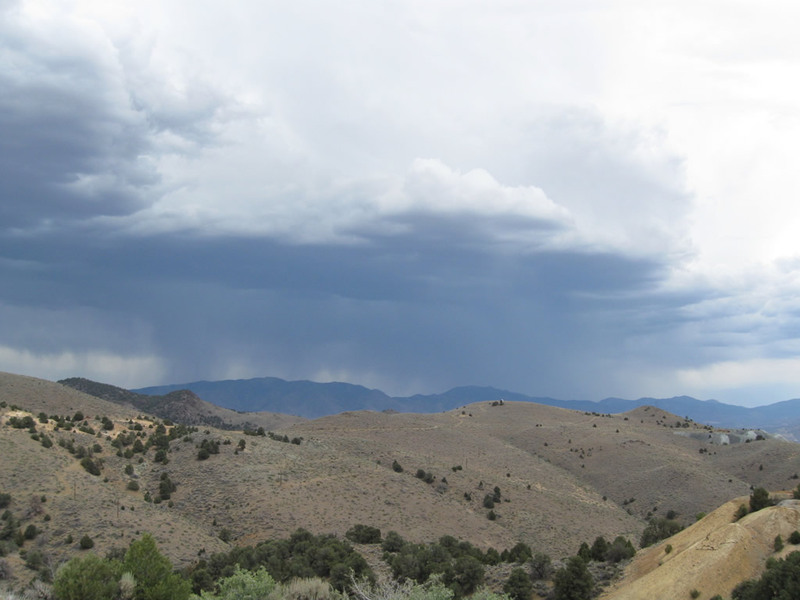 A good-sized summer thunderstorm brewed during the afternoon in the mountains above Gold Hill and Virginia City. Photos taken 07/23/09. Page Updated July 14, 2012.